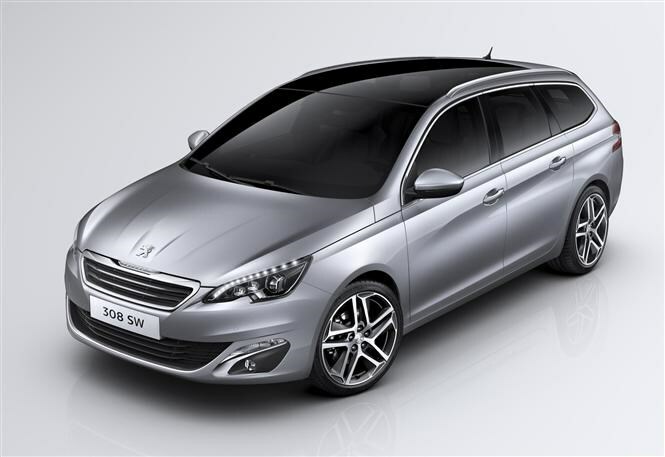 This is the Peugeot 308 SW, an estate version of the all-new 308 hatchback. Just like the previous-generation 308 SW, the ‘SW’ in the name stands for Station Wagon and practicality is what it’s all about. At 4.58m long it’s around a third of a metre longer than the regular 308 hatchback and offers 660 litres of boot volume (measured up to the window line). That's an impressive figure and greater than that of the Honda Civic Tourer, itself one of the current class leaders for luggage space. Helpfully, the seats can be folded totally flat to create a level load area and can be released by a single control in the boot. Like the 308 hatchback, the new Peugeot 308 SW is far lighter than the model it replaces. It’s carrying 140kg less to be precise, which should make it both better to drive and more fuel-efficient than its predecessor. A range of petrol and diesel engines will be available, the most efficient of which is the BlueHDi diesel version. This promises to emit just 85g/km of CO2 from new, which at current rates means zero car tax and very low company car tax costs. Like the hatchback, the interior will have a modern , minimal appearance with many of the cabin controls arranged on a large touchscreen in the centre of the dashboard rather than via physical dials and buttons. It will also feature the same unusual steering wheel , which is very small in diameter, and raised instrument cluster which is viewed over rather than through the steering wheel. Peugeot promises a high level of fit and finish and judging by the 308 hatchbacks we’ve driven so far that won’t be an exaggeration. Expect trim levels to mirror those of the hatchback, beginning with the entry-level Active grade and topped by the well-equipped Feline grade, with Active and Allure trims in the middle. The car will be unveiled to the public at the Geneva Motor Show in March 2014 and is set to go on sale later in spring. We’ve been impressed with the new 308 hatchback so the SW version is shaping up to be well worth a look. Check back soon for the full Peugeot 308 SW review on Parkers.